Robson Green recalls the moment he knew a change in direction was needed, as Stephen Milton reports. Robson Green recalls a point in his brief stint as a pop star when he knew it was time to call it a day. I remember singing on stage at the Royal Variety Performance with Jerome Flynn and suddenly, from out of nowhere, being filled with this immense feeling of humiliation, he chuckles heartily. There we were, squawking away in front of Elton John, David Bowie and Bon Jovi all of them staring at us, probably thinking who are these nuggets? Is this a joke? It certainly wasn't a joke for Simon Cowell, then an unknown RCA executive, who wagered his whole career on the success of the warbling Soldier Soldier heartthrobs. As we now know, he backed a winning horse and, during the mid-1990s, Robson and Jerome were the top-selling crooners in the country, with 1.9million purchases of Unchained Melody keeping the Geordie duo at number one for seven weeks. I like to call it my own personal Vietnam War, Green jokes in his exclusive interview with North East Life. I call it that because no matter how hard I try, I can't escape it. Artistically, it wasn't the greatest choice I ever made, although it's given me financial stability beyond my wildest dreams. And in turn I was able to invest in true artistic talent in the North East with my production company Coastal, giving people in the area a chance to do what they love. And what of Cowell, someone else who went on to forge a neat little career for himself? Simon Cowell is one of the smartest men I've ever encountered, a genius of his day. I'm so grateful he opened those doors for me. Jerome and I were pure novelty, but no-one had thought of doing something like that. Simon did. But you eventually come down from the high. And when my mum called me one evening to tell me Rolf Harris was on Animal Hospital looking after two hamsters called Robson and Jerome, I thought, Jesus, I've hit an all-time low here. That's when I knew I had to stop. As I remember it, Robson had a dicky leg. I hope he got it sorted. Green cuts a dashing figure in a light grey three-piece suit and co-ordinated open-necked charcoal shirt. Remarkably unscathed by the passing of time, and sporting a deep tan from a recent shoot in Africa for the new series of his Channel 5 show Extreme Fishing, the actor easily looks a decade younger than his 47 years. I'd say that's because of all the time I spent working outside, but surely that should age you more? he laughs. It could be that my days growing up as a scallywag in Dudley gave me a good start. The son of a miner in the small North Tyneside village, a young Robson knew his fate lay in the bright lights rather than the dark, dull echoes of the coalface. My dad's greatest wish was for me to never spend so much as two minutes down a mine, let alone the 40 years he was sentenced to, he says. When I was a kid, I used to see my dad come home dead shattered after his shift, his body so dirty and black. It was scary to see his bath water. So when I grew up and moved away, I felt as if Id escaped. Green had a bright happy childhood around his two sisters Dawn and Joanna, and it was when he attended Dudley Middle School that a teacher inspired his love for the stage. Howard Beckett, Mr Beckett, told me you were born to perform. He was the musical director and I loved him because he shaped my future at a school set in the middle of coal mines. If you looked out the window, that was what was ahead for you. After leaving school, and while working at the shipyards, Green was spotted by a casting director in an amateur production of Tom Hardaway's The Long Line. It promptly earned the actor his Equity card. I knew then that acting was what I wanted to do full-time, it was my passion. Since Soldier Soldier, Green has rarely been off our screens, bouncing between BBC and ITV series such as Reckless, Rocket Man, Wire in the Blood, Waterloo Road and Being Human and next hell star in the second season of the Sky sitcom Mount Pleasant. Currently single after parting ways with former model Vanya Seager, with whom he has a 12-year-old son, Taylor, Green splits his time between a Surrey home in West Clandon and his cottage on Coquet Island near Amble. I fell in love with Surrey many years ago but it will never compete with the North East. I'm always relaxed when I'm back. It's where I belong its home. It's my roots and my sense of identity it means everything to me. I love my home on the Coquet, walking in the Northumbrian hills and on the beaches with my son. It's a sense of belonging so I really love to spend my time there. It's important to remain close to where you came from. It is two decades this year that Robson & Jerome became the most unlikely of chart stars in the UK. Robson Green and Jerome Flynn managed to score several number one singles in the mid-1990s with covers of old classics. After Robson told Digital Spy that he doesn't look back at his singing career too fondly, we thought it would be a good time to look back at the duo's short-lived but massively successful music career. Let's get this out of the way. 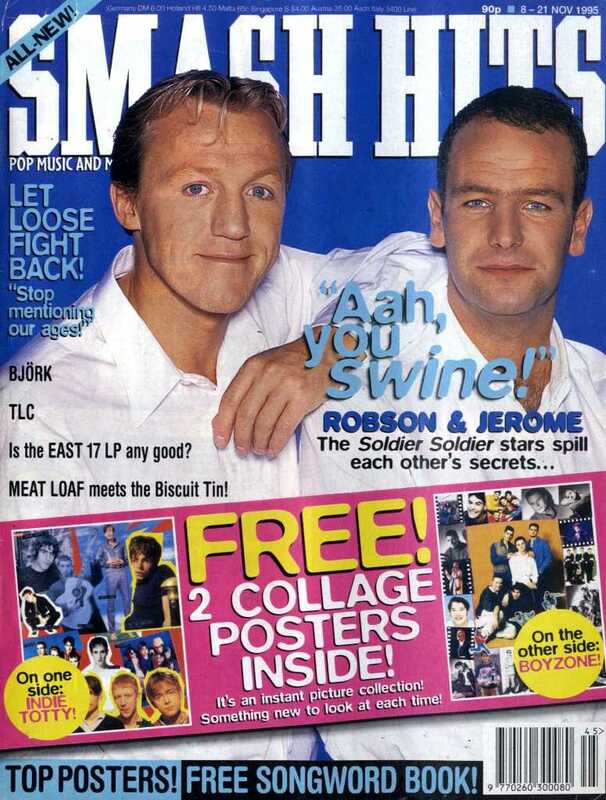 To this day, we still have chats with people who had no idea that the double 'ard Bronn and Jerome off Robson & Jerome are the same person. Who would have thought that Jerome would become such a badass? He also currently plays gruff Bennet Drake in Ripper Street. Green and Flynn (it feels weird calling them that) had starred in ITV period drama Soldier, Soldier since 1991, before one episode saw them performing 'Unchained Melody' together. A then-unknown music executive called Simon Cowell instantly put together contracts for the pair to record a studio version of 'Unchained Melody', capitalising on the 'fan of Heartbeat' target audience. Robson isn't too fond of Cowell today, after the TV judge's authorised biography had its fair share of negative comments about their work together. Plus, Green's second wife was Cowell's former assistant Vanya Seager. The pair have one son together, and separated in 2011. Their version of 'Unchained Melody' is in the top 20 of the best-selling songs ever, shifting a staggering 1.8 million copies in 1995. It also spent seven weeks at number one. So, in a year full of new Oasis, Take That and Michael Jackson songs, Robson & Jerome were by far the best-selling act. Their second single 'I Believe'/'Up on the Roof' was also number one for four weeks. Robson & Jerome are the only act in UK chart history to score a number one with a 'Triple A-side' single. We're not quite sure how the vinyl and cassette copies would have worked, but 'What Becomes of the Brokenhearted'/'Saturday Night at the Movies'/'You'll Never Walk Alone' had two weeks at the top in 1996, making it their final chart entry, keeping their 100% number one record intact. Don't think it was just the singles that your gran went out and bought, as Robson & Jerome's two studio albums both topped the chart. Robson & Jerome was also the 1995 Christmas number one, while Take Two settled for the festive number two spot. Both albums were full of cover versions of classic tunes. 1995 was quite a good year for pop. We had 'Back for Good', 'Kiss From a Rose' and 'Gangsta's Paradise' for a start. But there were a handful of great tracks that were denied a deserved number one by Robson & Jerome. Pulp's 'Common People', U2's 'Hold Me, Thrill Me, Kiss Me, Kill Me', Perez Prado's 'Guaglione' and Oasis's 'Wonderwall' were criminally denied number one positions in 1995. If you wondered where Flynn was between Robson & Jerome and Game of Thrones, then it was because he lived a largely reclusive life at a dilapidated farm in Pembrokeshire, while becoming a member of controversial guru Andrew Cohen's organisation. He eventually left the group several years later, describing it as "a very intense spiritual life, equivalent to being a monk for eight years". Since Soldier, Soldier and Robson & Jerome, Green has steadily starred in a number of successful TV dramas, including Strike Back, Wire in the Blood, Grantchester and Waterloo Road. He has also hosted a series of angling documentaries including Extreme Fishing and brand new show Ultimate Catch, showing off his genuinely impressive fishing skills in the process. In 2008, producer Mike Stock claimed that the pair, particularly Flynn, didn't sing large portions of their songs. In true Milli Vanilli style, they were replaced or patched with uncredited singers to reach the higher notes. He said: "Des Dyer was brought in to assist with the Jerome part - because his voice and Jerome's were similar. The Robson part was done by a totally different singer and the high note was a totally different guy." Robson Green has described his time as part of Robson & Jerome as his "personal Vietnam". The Grantchester and Strike Back actor scored three UK number one singles as part of the duo with Game of Thrones star Jerome Flynn in the mid-1990s. The chart-toppers mark their 20th anniversary in 2015. "I don't sing anymore," he told Digital Spy. "The singing came from a drama, and hey, what do you know, I'm in the Guinness Book of Records for the fastest-selling single - not many actors or presenters could say that! "Therapy got me out of it - it's my own personal Vietnam! - so if it's the 20th anniversary, it's something that happened a long time ago." He continued: "The good thing with the music is we knew when to stop. There was a programme, Animal Hospital, a woman brings in two guinea pigs called Robson & Jerome, and when asked, 'What seems to be the problem with the guinea pigs? ', she said, 'It's Robson, he's not right'. That was the moment where it felt this was not good karma." Robson & Jerome were created by Simon Cowell after they appeared in ITV drama Soldier, Soldier. They scored number ones with covers of 'Unchained Melody', 'I Believe' and 'Saturday Night at the Movies'. 'Unchained Melody' was the best-selling single of 1995, shifting an estimated 1,840,000 copies. Simon Cowell may have given Robson Green a hit single in the '90's but the actor is no fan of his former label boss' love of cosmetic surgery nor how he pestered his mother. 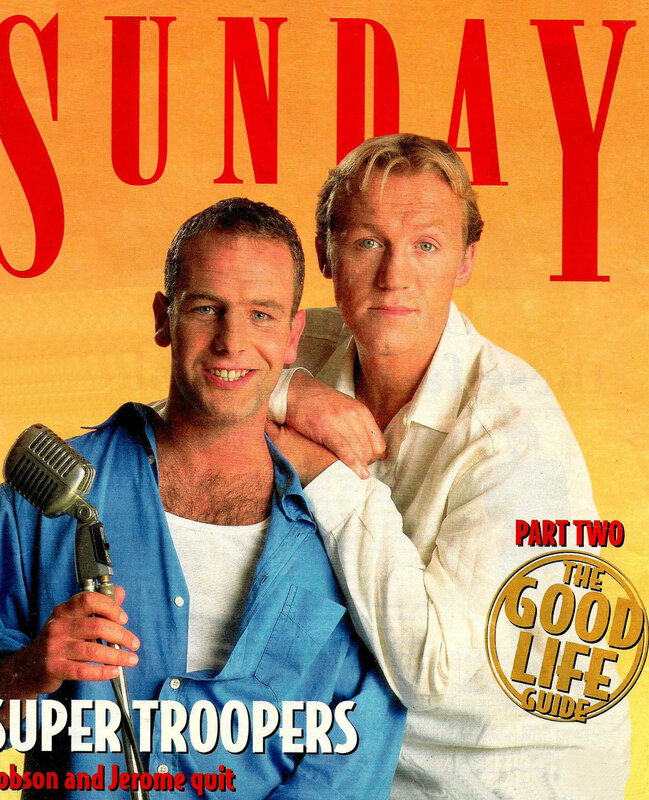 Robson Green joined forces with his 'Soldier Soldier' acting pal, Jerome Flynn, on a cover version of 'Unchained Melody' which Green didn't want to sing. "I didn’t want to sing. I was already being paid a fortune for what I was doing but Simon wouldn’t let it go. He was pestering my mother all the time, wanting me to sing that bloody song with Jerome. "I got a lawyer to stop him ringing her, then I called him myself and told him, “If you do it again I will take this to court. This is harassment. The amount was in seven figures ....... of course I said 'yes'." On the X Factor, Simon Cowell makes a fortune out of telling people they can't sing. Yet we can reveal that the stars who helped make his name, Robson and Jerome, themselves proved a little lacking in the vocal department. An additional three singers had to be used to keep the pair in tune on their first hit, Unchained Melody. As well as kick-starting Cowell's flagging career, the song became an overnight sensation after actors Robson Green and Jerome Flynn performed it in 1995 during an episode of the military drama Soldier, Soldier. It raced to the top of the charts and became the biggest-selling single of the decade. Unchained Melody, previously a hit for Jimmy Young, the Righteous Brothers and many more, was number one for seven weeks, sold 1.8million copies and raked in £17million for the record company BMG. When Cowell persuaded the actors to perform it, a string of bad business decisions had left him living with his parents. But its success transformed him into one of the world's most powerful music executives and helped him launch Pop Idol and X Factor, the latest series of which finished last weekend. Now legendary producer Mike Stock - of hit-makers Stock Aitken Waterman fame - has broken his silence to reveal the truth about how he hired session singer Des Dyer and two others to assist Robson and Jerome. He added, however: 'Robson and Jerome came into the studio and we did the vocals together. So they are singing on the record without a shadow of a doubt. 'In all sorts of recording contexts you have to look at the vocal and if it's not quite right you have to put it right. In this case we employed some backing singers to help repair some aspects of the vocal. 'It wasn't about being great singers. I've worked with loads of pop stars where the singing side of their attributes was the least important. Des Dyer, now 60, failed to benefit financially from the hit and now lives in a modest £300,000 detached house in Northampton. Stock, considered the most successful producer of all time with 100 top 40 UK hits, has admitted having a gagging order placed on Dyer after he threatened to reveal his role, saying 'it was going to blow the whole project apart'. Robson and Jerome went on to sell a total of 15million singles, albums and videos. At no point since their music careers ended has either man revealed the truth about their lack of singing prowess. They have both now returned to acting full-time. Green now stars in the ITV series Wire in the Blood, while Flynn has been in several films including Best, in which he played footballer Bobby Charlton. Simon Cowell, who is now worth £110million, talks about working with Robson Green and Jerome Flynn in his autobiography, I Don't Mean To Be Rude ... But. Yesterday Cowell's spokesman Max Clifford said he could not be contacted as he was on holiday in Barbados. Robson turns down pop relaunch?It sounds as if Robson’s had enough of the charts. Robson Green has apparently turned down the opportunity to relaunch his 90s pop duo with a new partner. The Geordie – who topped the charts when he was half of Robson And Jerome – was reportedly asked to record a single with Mark Benton, his partner from the City Lights and Northern Lights series. According to the Daily Express, execs thought the comedy duo would have as much success as the Soldier Soldier pair, who had hits with Unchained Melody and Up On The Roof. Despite the tempting offer, it seems Robson and Mark said no. When Robson Green and Jerome Flynn were called on to sing Unchained Melody in an episode of ITV’s hit Nineties military drama series Soldier, Soldier, it spawned one of the hottest pop acts around. Simon Cowell masterminded its release as a single after huge public demand and it raced to the top of the charts in 1995. 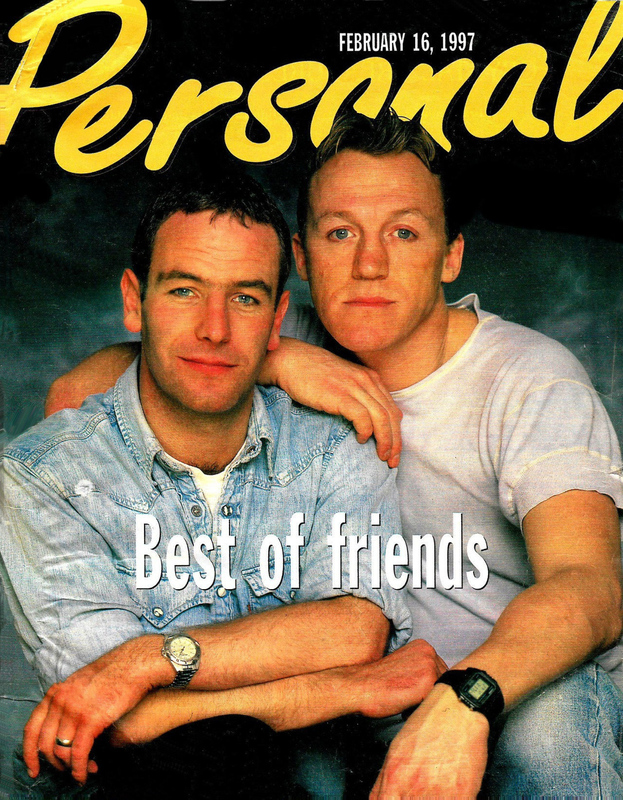 But after a couple more hits Robson and Jerome, as they were billed, went their separate ways, determined to turn their backs on the pop world for ever. Not only that but they have turned their backs on each other, too, it seems. Robson: Well, he cheated because he looked at the answers, and I bet his middle name isn't Patrick. Jerome: I'm surprised he got that many right. I'm the best at remembering stuff and I reckon I'd rather try eating his eggs than his so called Dim Sum. Robson: Right, I'm not going to cook you any more Dim Sum because of that !